Mr. Amad Varind Jat, Village- Mohadi, Taluka Abdasa and Adam Abdreman Jat, Village- Jangi, Bhachau were awarded for "Breed Savior Award-2011" by Seva Madurai, sponsored by National Biodiversity Authority. for Conservation of Kharai Camel Breed. 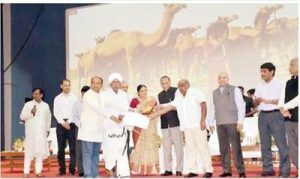 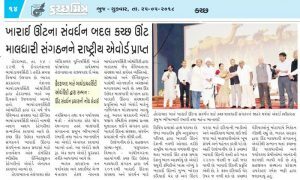 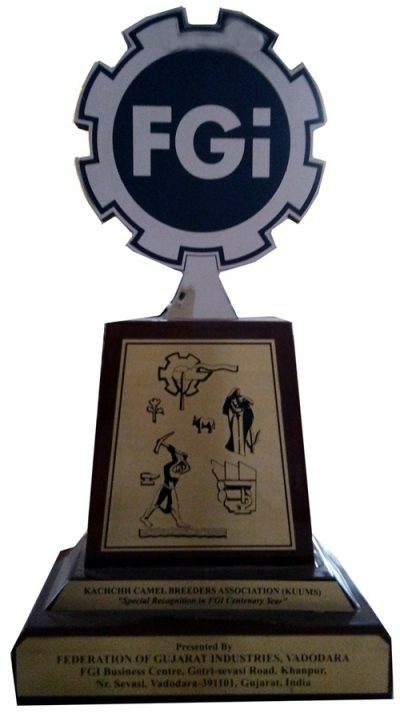 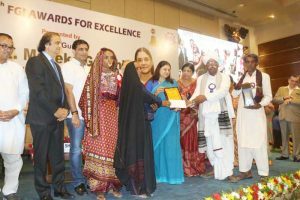 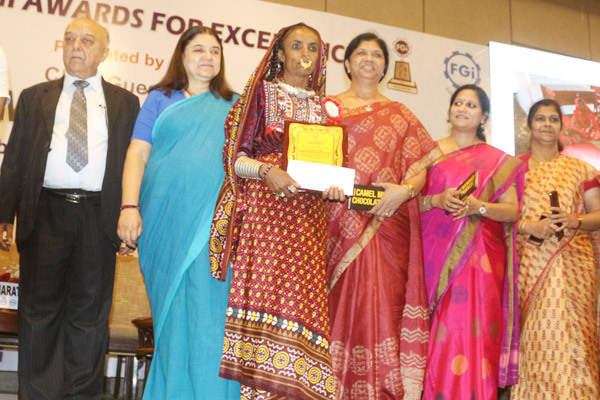 Kutch Unt Uchherak Maldhari Sangathan (KUUMS) awarded for 15th FGI (Federation of Gujarat Industries) Award 2018, for it's innovative initiative of Marketing of Camel Milk to Amul and Camel Milk Chocolate by Amul. 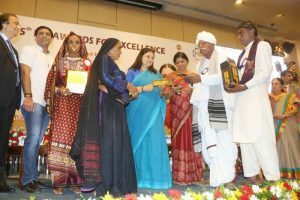 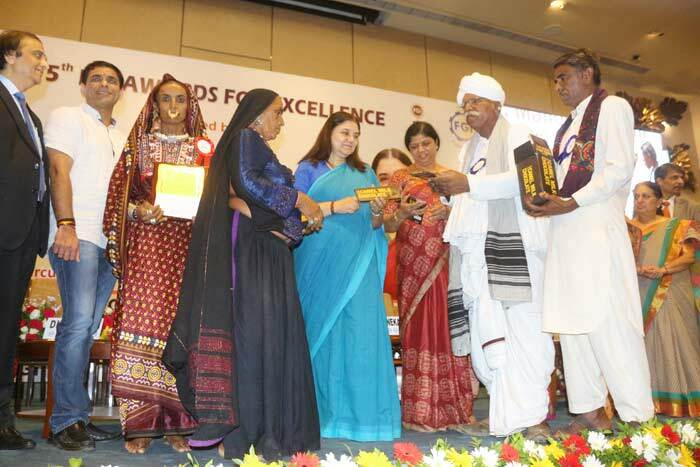 Menka Gandhi (Hon'ble Union Minister of Women and child welfare GoI) handed over this award to representatives of KUUMS on 14th April at Baroda. 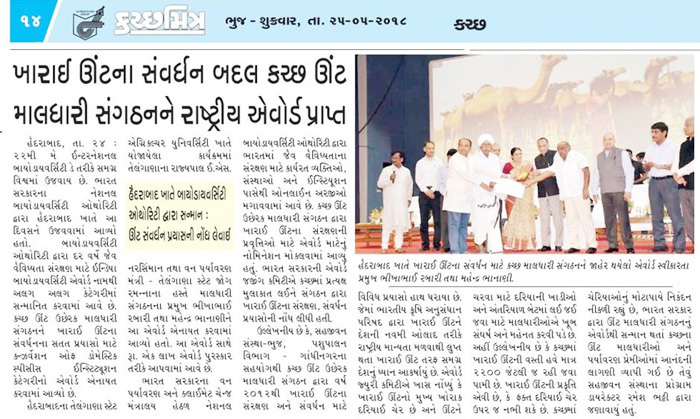 Few Photos are attached. Kutch Unt Uchherak Maldhari Sangathan (KUUMS) has been selected for the final list for India Biodiversity Awards 2018 under the category, "Conservation of Domesticated Species - Institution" Award Ceremony is scheduled on 22nd May 2018 at Hyderabad. 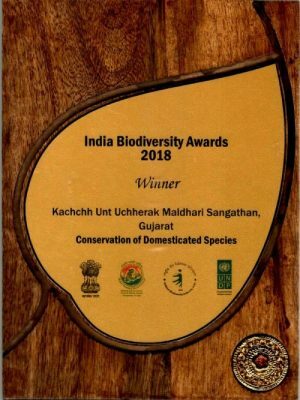 Kutch Unt Uchherak Maldhari Sangathan (KUUMS) has been selected for "Breed Savior Award-2017" by Seva - Madurai Sponsored by National Biodiversity Authority. 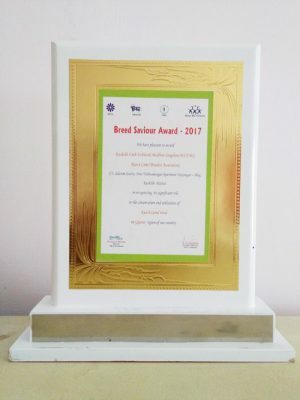 Award Ceremony is Scheduled on 21st May 2018 at BAGR-Karnal (Haryana).